There is no doubt that the Burnside is a victim of its geographical location. Discerning local golfers will tell you that it is an excellent test of golf but further afield it seldom receives the accolades it deserves simply because it has the misfortune to sit in the shadow of its more illustrious neighbour. It’s a classic test of links golf featuring narrow and undulating fairways bordered by heather, whins and strategically-placed pot bunkers. Ben Hogan played his first competitive round in Britain on it en-route to being crowned 1953 Open champion. Often overshadowed by the Championship course, the Burnside is an excellent test of golf with heather, gorse and pot bunkers all framing the fairways. Running alonside the main links, the Burnside features the famous Barry Burn which comes into play on the par-3 5th. 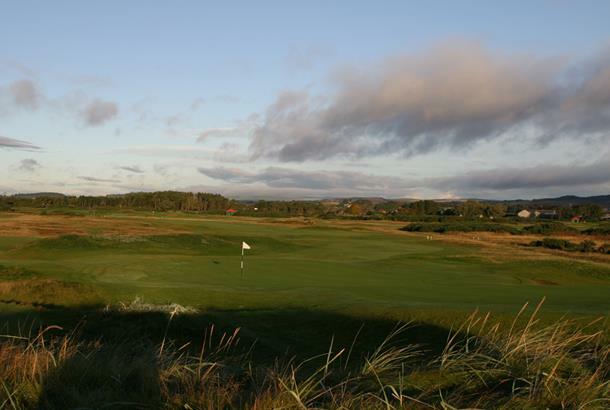 Ben Hogan played here to qualify for the Open Championship that he subsequently won in 1953. A real test of golf and in fantastic condition. The greens were superb and if this is the little brother,the championship has a lot to live up to.